Landbay Condominium is a low-density exclusive Balinese concept with Balinese women stone sculptures sprouting water greet the visitors. ‘Water’ is a very prominent element in this beautifully designed condominium. This Balinese condominium is located at Upper East Coast Road, and is near the East Coast beach and seafood restaurants, Siglap Centre, Bedok Central, Changi Airport and Parkway Parade Shopping Centre. One of the worst condo. Very cramped and overlooking into each other. Units facing the road are very noisey . Poor maintenance. 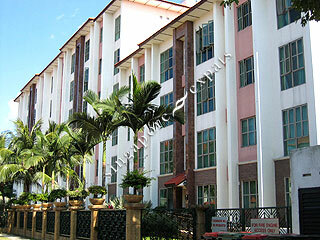 Balinese style estate, not to big (only 122 units, freehold) with an excellent location. Superb pool.